No doubt you're familiar with the Missionary Kid stereotype: awkward, out of style, out of touch. Unfortunately, it's a stereotype for a reason: because it's often true. Have you ever thought about "why?" Part of our extensive training touched on this subject. Kaylee has read (and is re-reading) Third Culture Kids. We're aware of the issues, and want to do our best to make sure that our girls are comfortable and well-adjusted no matter where they are. However, the fact remains that they are not "normal" here, and when we return to the States for furloughs, they won't be "normal" there either. Our church runs Horita Feliz (little happy hour), a weekly kids' program, in 4 surrounding neighborhoods. On Saturday, I took Anne to the one nearest us. Although we tried taking her a year ago, everything was still too much of a shock for her and she wasn't ready. I believe she is now, and we're going to make it a regular part of our week. We were the first ones to show up, even though we were 10 minutes late. She and I sat down and continued the conversation that we were having on the way there. Before long, 5 little girls showed up, all but one a year or two older than Anne. They sat there, chattering away, occasionally asking me something about Anne. They were very curious about her, in a friendly way, and eventually came and sat closer to us. That was when I realized: Anne is now at the age where girls really start to communicate and relate to each other verbally. And she's alone. She knows that one of the reasons we're going to Horita Feliz is so that she can have more exposure time in Spanish, and we talked about that as we sat there, waiting for the program to start. She said to me, "I wish we had not moved here. . .but I know that we had to." I'm proud of her attitude, even though she is often shy (sometimes rebelliously) and hesitant to use what she does know. She is learning. And she is finally showing some interest in putting effort into learning the language, because she sees the need for it. In the meantime, how much is her social development going to be set back?? Although kids do have an easier time picking up language naturally, it is simply not true that "they'll be speaking like natives before you know it" or "they'll be fluent before you are." It takes time and effort on their part as well, and they can't study like Kaylee and I do. Anne has a friend her age at church; they play together every Sunday. 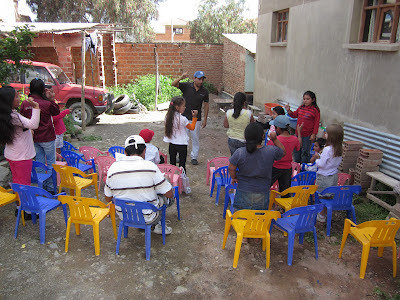 We also have a teenager and 20-something that have started to come over a few hours a week to play with the girls and give them more time in the language. As you pray for our progress in language learning, PLEASE do not forget to pray for that of our children as well! You know,since you posted that statement on FB about Anne being of the age girls start relating verbally, I've really been thinking about that-- about our own family dynamics and how our oldest girl is indeed like that at this age, but even when she is without a social situation to be with other little girls, she has an older brother that's on her level and absorbs her chattiness well. Anne doesn't have that, and so I've been thinking about all that, it's interesting and insightful. A good reminder that your children need lots of prayers too while you're on this adventure, thanks for sharing about this.